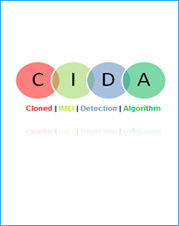 CIDA : CLONED IMEI DETECION ALOGORITHM (CIDA) comprises of members from varied important background all synergized to maintain sanctity to the ever increasing problem of IMEI abuse. CIDA plays the key role in identifying cloned IMEI no functional over the network with different operators. This program will discourage the use of cloned IMEI handsets for illegal purposes and also helps the network Operators in identifying the Non-Genuine & cloned IMEI numbers. With the help of this program we will also help to deter mobile theft so that people can use the mobile services in a proper manner. It includes a review of the AUTHENTICITY of a handset. It will help in identification of fake and duplicate IMEI among genuine IMEI numbers.